Preheat oven to 375 degrees. Heat oil in a cast iron skillet to medium-high heat. Add onion and saute 2-3 minutes, until translucent. Add purple potatoes and saute 3-5 minutes, until they start to brown on the outside. Add chicken sausage and saute 2-3 more minutes. Add garlic and saute 30 seconds. Stir in one tablespoon smoked paprika, cumin and a large dash of coarse salt and ground black pepper. Place in the oven and bake 8-12 minutes, until potatoes are tender; remove from the oven and allow to cool for a few minutes. Taste hash and adjust seasoning, if necessary. 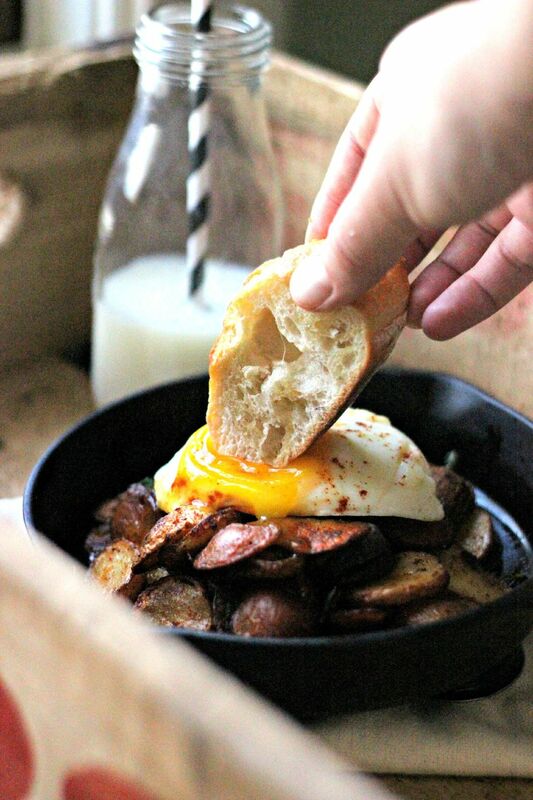 While potatoes and sausage cook in the oven, prepare eggs. Heat a greased medium nonstick skillet to medium-low heat. When pan is hot, crack eggs in the pan. Sprinkle with salt and black pepper. Cover the pan with a lid and reduce heat to low. Allow eggs to cook 3-5 minutes, until egg white has cooked, but the yolk is perfectly running. Serve fried eggs on top of hash and sprinkle with smoked paprika and thyme, if using. Serve with crusty bread.